Quake III Arena is a multiplayer-focused first-person shooter video game released in December 1999. The game was developed by id Software and featured music composed by Sonic Mayhem and Front Line Assembly founder, Bill Leeb. Quake III Arena is the third game in the Quake series and differs from previous games by excluding a traditional single-player element, instead focusing on multiplayer action. The single-player mode is played against computer-controlled bots. Notable features of Quake III Arena include the minimalist design, lacking rarely used items and features, the extensive customizability of player settings such as field of view, texture detail and enemy model, and advanced movement features such as strafe-jumping and rocket-jumping. Quake III Arena is available on a number of platforms and contains mature content. The game was highly praised by reviewers who, for the most part, described the gameplay as fun and engaging. Many liked the crisp graphics and focus on multiplayer. Quake III Arena has also been used extensively in professional electronic sports tournaments such as QuakeCon, Cyberathlete Professional League, Dreamhack, and the Electronic Sports World Cup. Unlike its predecessors, Quake III Arena does not have a plot-based single-player campaign. Instead, it simulates the multiplayer experience with computer-controlled players known as bots. The game's story is brief: "the greatest warriors of all time fight for the amusement of a race called the Vadrigar in the Arena Eternal." The introduction video shows the abduction of such a warrior, Sarge, while making a last stand. Continuity with prior games in the Quake series and even Doom is maintained by the inclusion of player models and biographical information. A familiar mixture of gothic and technological map architecture as well as specific equipment is included, such as the Quad Damage power-up, the infamous rocket launcher, and the BFG super-weapon. In Quake III Arena, the player progresses through tiers of maps, combating different bot characters that increase in difficulty, from Crash (at Tier 0) to Xaero (at Tier 7). As the game progresses, the fights take place in more complex arenas and against tougher opponents. While deathmatch maps are designed for up to 16 players, tournament maps are designed for duels between 2 players and in the single-player game could be considered 'boss battles'. The weapons are balanced by role, with each weapon having advantages in certain situations, such as the railgun at long-range and the lightning gun at close quarters. The BFG super-weapon is an exception to this; compared to other similarly named weapons in the Doom/Quake series, Quake III Arena's incarnation of this weapon is basically a fast-firing rocket launcher and it is found in hard-to-reach locations. Weapons appear as level items, spawning at regular intervals in set locations on the map. If a player dies, all of their weapons are lost and they receive the spawn weapons for the current map, usually the gauntlet and machine gun. Players also drop the weapon they were using when killed, which other players can then pick up. Quake III Arena comes with several gameplay modes; Free for All (FFA), a classic deathmatch, where each player competes against the rest for the highest score, Team Deathmatch (TDM), where usually two teams of four compete for the highest team frag total, Tournament (1v1), a deathmatch between two players, usually ending after a set time, and Capture the Flag, which is played on symmetrical maps where teams have to recover the enemy flag from the opponents' base while retaining their own. Quake III Arena was specifically designed for multiplayer. The game allows players whose computers are connected by a network or to the internet, to play against each other in real time, and incorporates a handicap system. It employs a client–server model, requiring all players' clients to connect to a server. Quake III Arena's focus on multiplayer gameplay spawned a lively community, similar to QuakeWorld, that is active to this day. The playable characters in bold have already appeared in previous entries in the Quake series, or in id Software's sister franchise, Doom. During early March 1999, ATI leaked the internal hardware vendor (IHV) copy of the game. This was a functional version of the engine with a textured level and working guns. The IHV contained most of the weapons (excepting the Gauntlet) that would make it into the final game although most were not fully modeled; a chainsaw and grappling hook were also in the IHV but did not make it into the final release. Many of the sounds that would make it into the final release were also included. After the IHV leak, id Software released a beta of the game called Quake III Arena Test on April 24, 1999. The Q3Test started with version 1.05 and included three levels that would be included in the final release: dm7, dm17, and q3tourney2. Id Software continued to update Q3Test up until version 1.09.
id co-founder and former technical director John Carmack has stated that Quake III Arena is his favourite game he has worked on. A mirror reflects Sarge and the Quake III logo in the opening scene of the first level, Q3DM0. The id Tech 3 engine is the name given to the engine that was developed for Quake III Arena. Unlike most other games released at the time, Quake III Arena requires an OpenGL-compliant graphics accelerator to run. The game does not include a software renderer. The graphic technology of the game is based tightly around a "shader" system where the appearance of many surfaces can be defined in text files referred to as "shader scripts." Quake 3 also introduced spline-based curved surfaces in addition to planar volumes, which are responsible for many of the surfaces present within the game. Quake 3 also provided support for models animated using vertex animation with attachment tags (known as the .md3 format), allowing models to maintain separate torso and leg animations and hold weapons. Quake 3 is one of the first games where the third-person model is able to look up and down and around as the head, torso and legs are separate. Other visual features include volumetric fog, mirrors, portals, decals, and wave-form vertex distortion. For networking, id Tech 3 uses a "snapshot" system to relay information about game "frames" to the client over UDP. The server attempts to omit as much information as possible about each frame, relaying only differences from the last frame the client confirmed as received (Delta encoding). id Tech 3 uses a virtual machine to control object behavior on the server, effects and prediction on the client and the user interface. This presents many advantages as mod authors do not need to worry about crashing the entire game with bad code, clients could show more advanced effects and game menus than was possible in Quake II and the user interface for mods was entirely customizable. Unless operations which require a specific endianness are used, a QVM file will run the same on any platform supported by Quake III Arena. The engine also contains bytecode compilers for the x86 and PowerPC architectures, executing QVM instructions via an interpreter. Quake III Arena features an advanced AI with five difficulty levels which can accommodate both a beginner and an advanced player, though they usually do not pose a challenge to high-tier or competitive players. Each bot has its own, often humorous, 'personality', expressed as scripted lines that are triggered to simulate real player chat. If the player types certain phrases, the bots may respond: for example, typing "You bore me" might cause a bot to reply "You should have been here 3 hours ago!". Each bot has a number of alternative lines to reduce the repetition of bot chatter. The Gladiator bots from Quake II were ported to Quake III Arena and incorporated into the game by their creator - Jan Paul van Waveren, aka Mr. Elusive. Bot chat lines were written by R. A. Salvatore, Seven Swords and Steve Winter. Xaero, the hardest opponent in the game, was based on the Gladiator bot Zero. The bot Hunter appears on magazine covers in the later id game Doom 3. On August 19, 2005, id Software released the complete source code for Quake III Arena under the GNU General Public License, as they have for most of their prior engines. As before, the engine, but not the content such as textures and models, was released, so that anyone who wishes to build the game from source will still need an original copy of the game to play it as intended. Like its predecessors, Quake and Quake II, Quake III Arena can be heavily modified, allowing the engine to be used for many different games. Mods range from small gameplay adjustments like Rocket Arena 3 and Orange Smoothie Productions to total conversions such as Smokin' Guns, DeFRaG, and Loki's Revenge. The source code's release has allowed total conversion mods such as Tremulous, World of Padman, OpenArena, and Urban Terror to evolve into free standalone games. Other mods like Weapons Factory Arena have moved to more modern commercial engines. Challenge ProMode Arena became the primary competitive mod for Quake III Arena since the Cyberathlete Professional League announced CPMA as its basis for competition. CPMA includes alternative gameplays, including air-control, rebalanced weapons, instant weapon switching, and additional jumping techniques. Another mod that underwent several open beta versions and was very popular in 1999-2001 was Quake 3 Fortress (Q3F). The initial version of this game was an indirect port of the Quakeworld Team Fortress mod with many clans and leagues competing in both games simultaneously. Q3F was eventually ported to another Quake 3 mod Enemy Territory Fortress which had limited success. The developers of Q3F eventually abandoned the mod but used it to create the standalone 2003 game Wolfenstein: Enemy Territory, which uses the Quake 3 engine and is still popular with approximately 9,400 active players in 2018. An expansion pack titled Quake III: Team Arena was released on December 18, 2000 in North America, January 15, 2001 in Japan and January 26, 2001 in Europe. It was developed by id Software and published by Activision. The expansion focused on team-based gameplay through new game modes, as well as the addition of three new weapons (the Chaingun, Nailgun, and Prox Launcher), and new items and player models. Quake III: Team Arena was criticized, as its additions were long overdue and had already been implemented by fan modifications. Quake III: Gold was later released on September 26, 2001 in North America, March 29, 2002 in Japan and August 9, 2002 in Europe, including the original Quake III Arena and the Quake III: Team Arena expansion pack bundled together. Front Line Assembly made the soundtrack for the expansion, the counterpart to Sonic Mayhem's Quake III Arena: Noize. Quake III Arena was released for the Dreamcast (ported by Raster Productions and released by Sega) in 2000 and featured 4 player online play versus Dreamcast and PC gamers. It is often considered one of the best PC to console ports of its time due to its smooth frame rate and online play. There are still communities that play this version online on the remaining dedicated servers running patch version 1.16n and the required map pack. Quake III Revolution (ported by Bullfrog Productions, published by Electronic Arts in North America and Electronic Arts Square in Japan) was released for the PlayStation 2 in 2001 featuring several elements adopted from Team Arena, along with a more mission-based single-player mode. It features split-screen multiplayer for up to 4 players (with PS2 Multitap), as well as the Id Software new animated logo called "The Laboratory" [b], but lacks mouse support. It also lacks online play, as the PS2's network adapter was not released outside of Japan until 2004. Gamerankings.com rated the release at 83%. The PlayStation 2 version was widely criticized for having long loading times (which typically averaged over a minute compare to the Dreamcast and PC version). Quake III: Team Arena was revealed in an ESRB listing for the Xbox 360. The title was developed by Pi Studios. Quake III Arena for the 360 was officially announced by id at QuakeCon 2007. The title, jointly developed by id and Pi Studios, was released on Xbox Live Arcade on December 15, 2010. The retail price of the game was set at 1200 Microsoft Points, or $15 USD. Quake Arena DS for the Nintendo DS was announced at QuakeCon on August 4, 2007. John Carmack announced the game and said that touch screen controls would not be implemented as much as in Metroid Prime Hunters, for example. He stated that he would like all shooting in the game to be controlled with the D-pad instead of the Touch Screen. This version was silently cancelled. Quake Zero was announced at QuakeCon on August 3, 2007 and will be an updated version of Quake 3 Arena, distributed by free download, run in a browser window and supported by built-in advertising content. On February 20, 2008 id announced that Quake Zero would be launched as Quake Live. Quake Live was released in 2010. Quake III Arena has been unofficially ported to several consoles, including the PlayStation Portable handheld and Xbox console. These versions require a modified console or handheld and the assets to the game to go along with the source port. Carmack has said that Quake Trilogy (including Arena) will be ported on the iPhone/iPod Touch/iPad. An unofficial version for iOS was released through Cydia for jailbroken iOS devices in April 2008; it is a demo version similar to the original except that it integrates the iPhone and iPod Touch's accelerometer and touch controls to make gameplay possible. A high-definition version for iPad was released in November 2010, featuring re-created controls, sharper graphics, better gameplay, and better framerate; this improved version was also integrated into the iPhone and iPod touch version of the port. A Moorestown prototype version was demonstrated on a reference design that demonstrated performance of up to 90 frames per second. An unofficial port of Quake III for Symbian mobile devices was made. It requires PAK files from original game to run. An unofficial port of the game to Android was created based on the released source code. This means the game can be run on several Android powered devices, most notably the Motorola Milestone, Motorola Droid, and the Nexus One, as well as other high specification Handsets. In August 2011, the ARM-based Raspberry Pi credit card-sized computer was shown running a specially compiled ARM version of Quake III on Debian. Quake III's sales surpassed 50,000 copies during its first three days of release, by which time 1 million copies had been printed. It debuted at #5 on PC Data's weekly computer game sales chart for the December 5–11 period. The game rose to fourth place in the weekly top 10 the following week. Domestically, it sold 222,840 copies and earned revenues of $10.1 million by early 2000. In North America, Quake III sold 168,309 copies and earned $7.65 million from January through October 2000, according to PC Data. Its overall sales in the region, including its launch in 1999, totaled 319,970 units by November 2000. Its sales for 2000 alone ultimately reached 190,950 units and $8.4 million by the end of the year. The game later received a "Silver" sales award from the Entertainment and Leisure Software Publishers Association (ELSPA), indicating sales of at least 100,000 copies in the United Kingdom. Reviews for the game were very positive, with many describing the game as fast and addictive. Curved surfaces were a welcome addition to the series. Most reviewers felt the game was best when played with others online. A GameSpot review by Jeff Gerstmann described the game as outstanding. He noted the fun level designs, great-looking textures, impressive special effects and weapons sounds. The GameSpot review criticised the narrator's voice and thought that some levels could become too crowded when playing multiplayer. An IGN review felt the game lacked originality but enjoyed the detailed wall textures and outer space jump levels. The high number of character skins and the artificial intelligence of opponent bots were praised but the weapons were said to be "bland and predictable". A Eurogamer review described the game as "polished" and "stunning" and thought that it "was extremely well balanced and plays very well". The reviewer was especially pleased with the customisable 3D engine and looked forward to new maps and mods. Quake III Arena won PC Gamer US's 1999 "Special Achievement in Graphics" award, and wrote that it "set a new high-water mark in 3D graphics this year." The game was a finalist for the Academy of Interactive Arts & Sciences' 1999 "Action Game of the Year" award, which ultimately went to Half-Life: Opposing Force. Quake III Arena's multiplayer-focused development led to it developing a large community of competitive players and like its predecessors it was used extensively in professional electronic sports tournaments. In competitive Quake III Arena there are two distinct gameplays, often referred to as 'rulesets', the out-of-the-box Quake III Arena game, also known as vanilla Quake 3 (VQ3), and the CPM ruleset of the Challenge Pro Mode Arena mod. On July 26, 2006, Challenge Pro Mode Arena with VQ3 gameplay was chosen by Cyberathlete Professional League as the mod of choice for their tournament, making it the standard competitive mod for Quake III Arena. Previously, Orange Smoothie Productions was the most widely used tournament mod. These competitions have now moved on to more recent games or have transitioned to its variant successor, Quake Live. ^ The Dreamcast version of the game was composed by Aubrey Hodges and Dale Stump under the pseudonym Razor. ^ this animated logo also seen on the Console version of Return to Castle Wolfenstein, as well as Doom 3 and Quake 4. ^ a b c d Jeff Gerstmann (December 16, 1999). "Quake III Arena Review". GameSpot. CBS Interactive Inc. Retrieved 23 January 2012. ^ Connors, William W.; Rivera, Mike; Orzel, Sylvia. Quake 3 Arena Manual. ^ a b Shawn Sparks (January 11, 2000). "Quake 3 review for the DreamCast". Game Revolution. AtomicOnline, LLC. Retrieved 27 January 2010. ^ "Quake III Arena IHV Test Leaked)". Blue's News. 1999-03-01. Retrieved 2008-08-12. ^ "A Review of Q3 after the fact)". IGN. 2006-07-14. Archived from the original on 2011-07-13. Retrieved 2008-08-12. ^ Kent, Steven L. (2004). The making of Doom III. Emeryville, Calif.: Osborne. ISBN 0072230525. ^ Paul Jaquays, Brian Hook. "Quake III Arena Shader Manual". p. 5. Archived from the original on 2001-02-23. Retrieved 2006-10-01. ^ "Book of Hook: The Quake3 Networking Model". Retrieved 2006-10-01. ^ "The Quake III Bot, J.P. van Waveren" (PDF). Retrieved 2011-08-17. ^ "Quake III Arena Credits". GameFAQs. Retrieved 2007-05-16. ^ "Quake 3: Arena Source GPL'ed)". Slashdot. 2005-08-20. Retrieved 2008-06-23. ^ "Quake 3 Arena Dreamcast)". Metacritic. 2008-08-12. Retrieved 2008-08-12. ^ "Quake 3 Arena: Dreamcast Map-pack Installation and Play Instructions)". Quake3World. 2004-06-01. Archived from the original on December 6, 2006. Retrieved 2008-08-12. ^ "Quake III Revolution Release Information". ^ "Quake 3 Revolution - PS2)". Gamerankings.com. 2001-03-26. Retrieved 2008-08-12. ^ Doug Perry (27 March 2001). "Quake III: Revolution Review". IGN. Retrieved 26 July 2015. ^ "ESRB leaks 'Quake III: Team Arena' for Xbox 360. (XBLA?) At QuakeCon2009 the name was changed to Quake Arena Arcade". Joystiq. 2007-04-09. Retrieved 2007-05-16. ^ "Quake Arena coming to XBLA)". Eurogamer.net. 2007-08-04. Retrieved 2008-08-12. ^ "Quake Arena Arcade - Xbox.com". Marketplace.xbox.com. 2010-12-15. Retrieved 2011-08-17. ^ "John Carmack Talks Nintendo Quake Arena)". Spong.com. 2007-08-06. Retrieved 2008-08-12. ^ "GGL Wire ? QuakeCon 2007: John Carmack keynote video". Wire.ggl.com. 2007-09-24. Archived from the original on 2009-02-01. Retrieved 2011-08-17. ^ Grant, Christopher (2008-02-20). "GDC08: Quake Zero becomes Quake Live". Joystiq.com. Retrieved 2011-08-17. ^ Haroon Malik (April 5, 2008). "Quake 3 Arena Ported to iPhone; Let the Networked Games Commence". Gizmodo. Retrieved November 25, 2011. ^ Jesus Diaz (November 5, 2010). "Full Quake 3 Arena for iPad, At Last and For Real". Gizmodo. Retrieved November 25, 2011. ^ Taimur Asad (November 6, 2010). "Quake 3 Arena HD for iPad is Now Available for Download! Jailbreak App". Redmond Pie. Retrieved November 25, 2011. ^ "Aava Mobile's Intel Moorestown prototype plays World of Warcraft beautifully (video)". Engadget.com. Retrieved 2011-08-17. 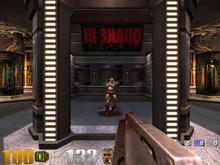 ^ Quake 3 Finally Ported To The Nexus One Phandroid, May 10, 2010. ^ "Demo - Raspberry Pi running Quake 3 - Raspberry Pi". 27 August 2011. ^ Ajami, Amer (December 13, 1999). "Quake III Sales Through the Roof". GameSpot. Archived from the original on March 4, 2000. ^ Fudge, James (December 23, 1999). "Disney says you want to be a millionaire". Computer Games Strategy Plus. Archived from the original on May 15, 2005. ^ Ajami, Amer (January 5, 2000). "Millionaire Still Strong". GameSpot. Archived from the original on March 2, 2000. ^ Asher, Mark (March 10, 2000). "Game Spin: Daika-X-Box". CNET Gamecenter. Archived from the original on January 12, 2001. ^ Asher, Mark; Chick, Tom. "The Year's Ten Best-Selling Games". Quarter to Three. Archived from the original on February 2, 2001. Retrieved May 27, 2018. ^ Staff (November 2000). "Where Have All the Legends Gone? ; By the Numbers". PC Gamer US. 7 (11): 42, 43. ^ Staff (April 2001). "It's All in the Numbers". PC Gamer US. 8 (4): 40, 41. ^ a b Mat (December 16, 1999). "Quake 3 Arena Review". Eurogamer. Eurogamer Network Ltd. Retrieved 27 January 2010. ^ a b Tal Blevins (December 10, 1999). "Quake III: Arena - PC Review". IGN. IGN Entertainment, Inc. Retrieved 27 January 2010. ^ "クエイクIII レボリューション まとめ [PS2] / ファミ通.com". Kadokawa Dwango. Retrieved 15 May 2017. ^ "Quake III Arena Review". Maximum PC. Future US: 86. February 2000. ^ Mark Smith (October 10, 2000). "Quake 3 Review". Game Chronicles. Retrieved 27 January 2010. ^ Brian Peterson (June 11, 2000). "Quake 3 Arena Review (DreamCast)". Gaming Age. Gaming Age Online. Archived from the original on May 19, 2001. Retrieved 27 January 2010. ^ "Quake III Arena for PC". GameRankings. CBS Interactive Inc. Retrieved 15 May 2017. ^ "Quake III Revolution for Sony PlayStation 2". GameRankings. CBS Interactive Inc. Retrieved 15 May 2017. ^ "Quake III Arena for Sega Dreamcast". GameRankings. CBS Interactive Inc. Retrieved 15 May 2017. ^ "Quake III Arena for Dreamcast". Metacritic. CBS Interactive Inc. Retrieved 15 May 2017. ^ "Quake III Revolution for Sony PlayStation 2". Metacritic. CBS Interactive Inc. Retrieved 15 May 2017. ^ "Third Interactive Achievement Awards; Personal Computer". Academy of Interactive Arts & Sciences. Archived from the original on September 3, 2000. ^ "CPL Chooses CPMA Mod, VQ3 Ruleset". 2006-07-06. Archived from the original on December 12, 2007. Retrieved 2007-05-16. This page was last edited on 20 April 2019, at 00:40 (UTC).